So I started this blog one year ago today, and it seems appropriate to do a little retrospective. It began cautiously. I had been thinking of getting serious about photography on and off for a few years. In the summer of 2009 I actually started doing it. I began playing with HDR. I bought Photoshop and some additional plugins and started working with them also. You can never have too much glass. There is too much glass that I want to buy. Owning too much glass can make you lose your focus. At different times I believe in all of these, although I admit the first is closest to my heart. My first post was from the oldest digital photograph of mine that I like outside of family photos. I bought a Kodak DC 4800 point and shoot in July 2001 as my first digital camera, and took it on a family trip to San Francisco the week before 9/11 for a friend’s wedding. I had one small memory card and had to be careful with my image count for the trip; I was walking to Lombard Street, the one with the crazy switch turns, to try for a shot. I did not get one there that I liked, but I have always liked the shot I took of a row of houses on Mason Street, and it became my first post. As I said, I started cautiously, planning to post 1-2 photos a week until I had a nice batch of images posted before I told anybody about the blog. Then, beyond telling some friends, I had basically no plan to publicize the site or draw visitors. All of that changed about a week later. On October 26 , 2009, Trey Ratcliff launched his Stuck In Customs Twitter Community to connect his photographer friends to each other. Now Trey is pretty much this blog’s blogfather. His HDR evangelization and encouraging attitude had a lot to do with getting me started. I saw his Twitter idea as a great way to connect to others and promote my newly born blog. I was concerned, however, that people would come by and see almost no content. So I actually put up two posts on the 26th, including one in which I translate some Scott Kelby Lightroom settings into Aperture, and then another post on October 29. Trey suggested, in his post launching the community, that people put their name, twitter account, web address and so in in a comment. You can see I left a regular comment early on asking about the image that went with Trey’s post, but did not add my web information until comment number 82, and in between I added the new material. Looking back at the list, I see, among the many entries, various people with whom I still maintain a connection, some on Twitter and a few on Facebook. Stuart Reid was comment 15, Jacques Gude the fotofreq (photo freak) was 19, and there are several others: Dave Wilson, Katie Harbath, James Howe, Michael Tuuk, Matty Wolin the Shutter Runner, Daryl “Butch” Butcher, Hector Garza, Pat O’Brien, and Scott Wyden Kivowitz were all in that first set. There were also a lot of people who misused the community, but this is not their story. What is relevant is that from that initial set, I started connecting with a great community of photographers, not just in the U.S., but around the world. I have photographer friends in Europe, Asia and Latin America. It has been a great year. I covered most of this month above. I made six posts, and I think my favorite image is the one outside my office at work. My pace slowed, with only 6 posts for a full month. I also managed to snag an HDRSpotting invite code on Twitter, so I was able to start posting there. The other big event is that I bought a Nikon D700, moving up to a full frame DSLR. 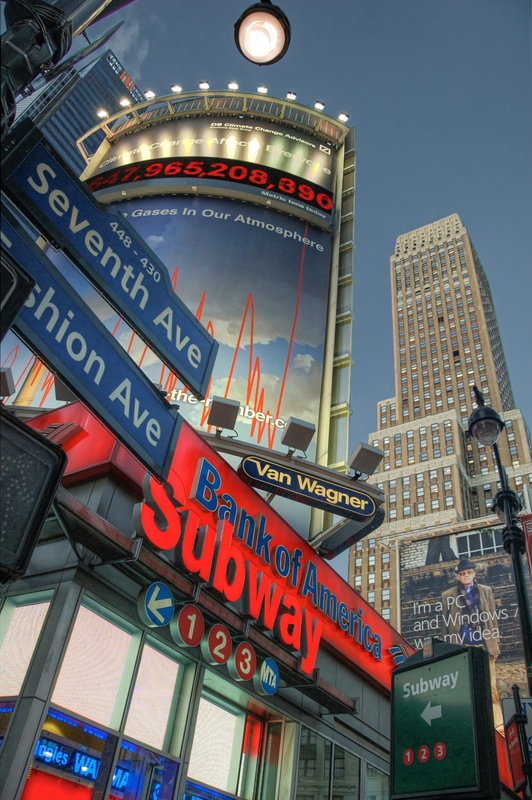 This shot of a group of signs at the corner of 33rd and Seventh is a big favorite of mine to this day. I slowed down a bit, with 11 posts but only 10 pictures. Picking my favorite is easy. 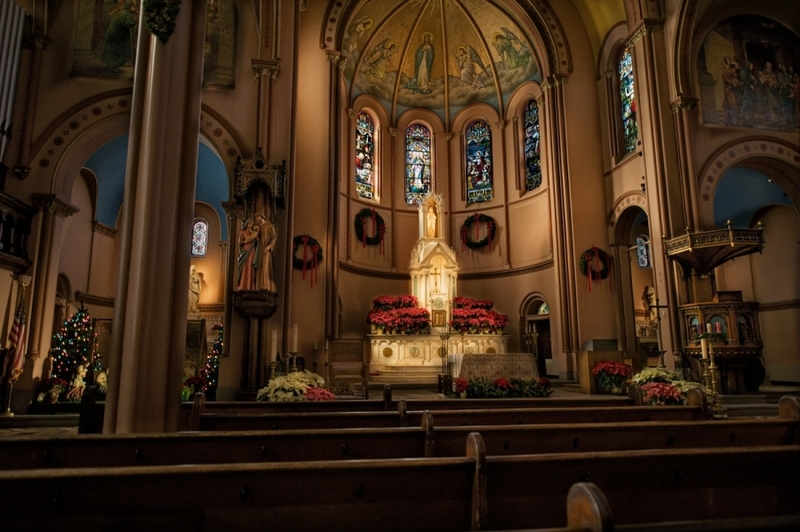 It is the image I took of St. Mary’s, the church I attended growing up in Yonkers, NY. I improved the pace of posting images again, with 16 images in 28 days, although one was a revision to an earlier image, because I figured out how to fix the weird sky effects you sometimes get in HDR images, and also with application of the Lucis Pro filter. While I am happy with most of the images, none stand out to me today, so the favorite is somewhat random. If I wrote this post a different day I might very well choose another, but the 72nd Street Subway Station is one of my favorite lesser known NYC landmarks. This was a big month. 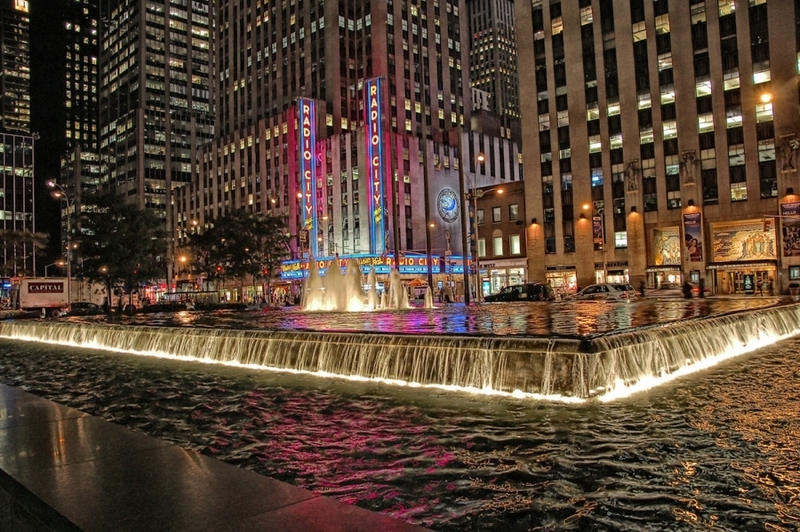 The Times Square photo I posted in December won Honorable Mention in the Nikonians 10th Anniversary contest. On the 1st of the month I posted my first black and white image on the blog. I made 20 posts, and also started practicing candid street photography, which immediately led to a pair of series, Bus Stops and Crosswalks, that have since combined for more than 100 images so far. Picking a favorite is tough, but I think I have to go with Crosswalk No. 2. The biggest development was that on the 9th I started posting 2 Bus Stop and 2 Crosswalk shots each week, which also started a practice of posting every day which I have since kept up, some days posting even more than one image. 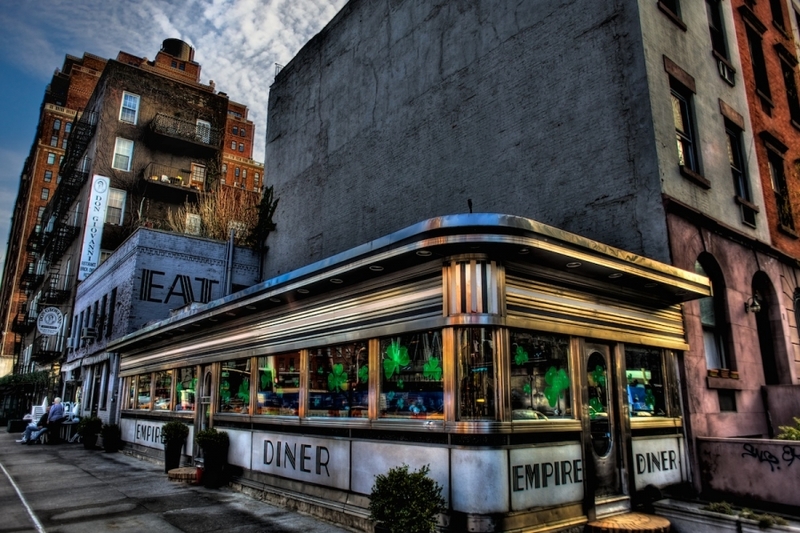 I’m pretty sure my favorite has to be this shot of the Empire Diner, which has since closed. I start hitting my groove, as the kids say. 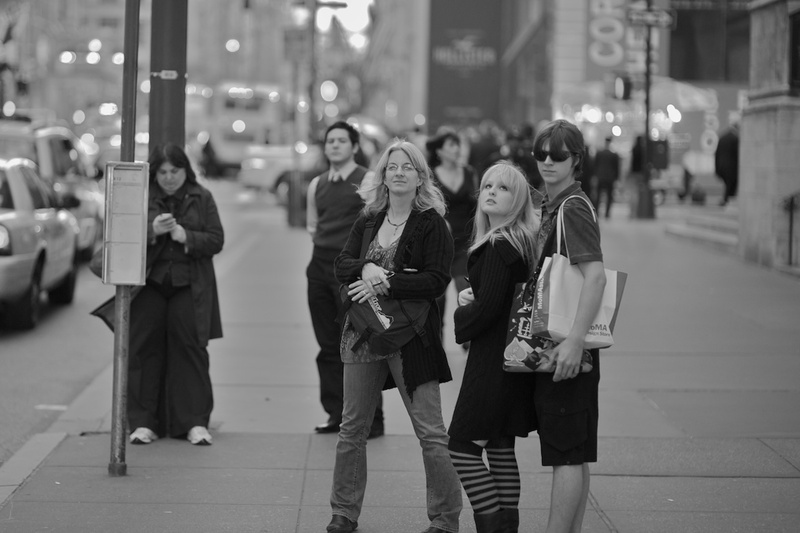 A post every day, with a balance of color, mostly HDR, and black and white street candids. It’s a tough call for the favorite, but I’m going with Crosswalk No. 18. This month features more than one post every day, with a lot of shots I took Memorial Day weekend, many in lower Manhattan. 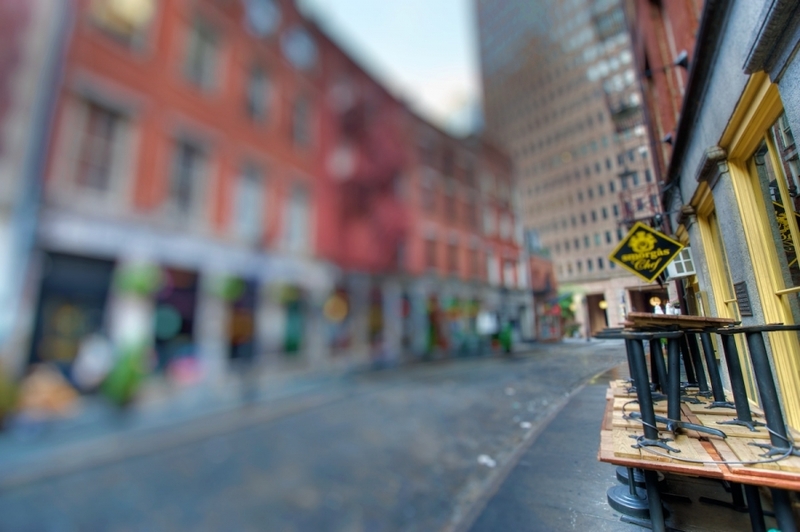 It was very tough picking a favorite, as I really love this 20-20 Vision shot, but I have to go with Bus Stop No. 26. I drove about 6 hours to shoot 3 abandoned diners, and loved the entire day. I participated in the Jersey City version of the Scott Kelby sponsored World Wide Photo Walk. 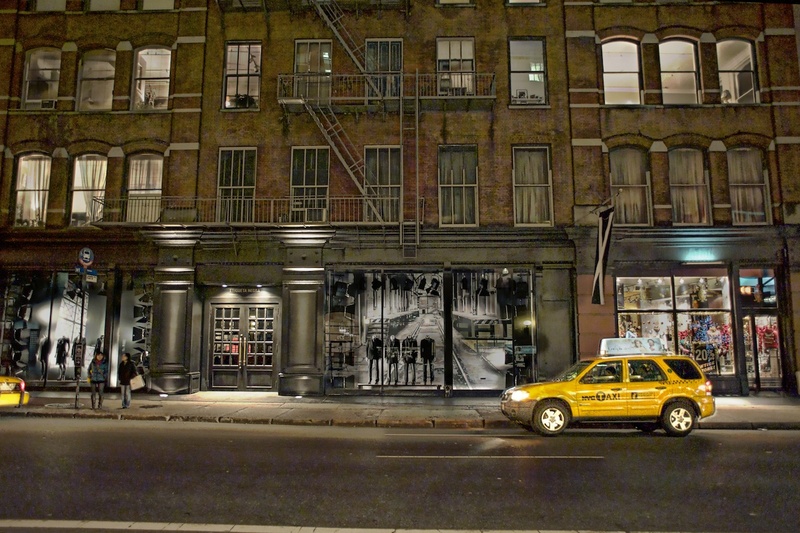 My favorite is this one of Stone Street in lower Manhattan. I managed to get pneumonia somehow, but kept going. I posted an image of the closed Domino’s Sugar Refinery in Brooklyn, and surprised myself with a non-partisan political screed that people seemed to like. 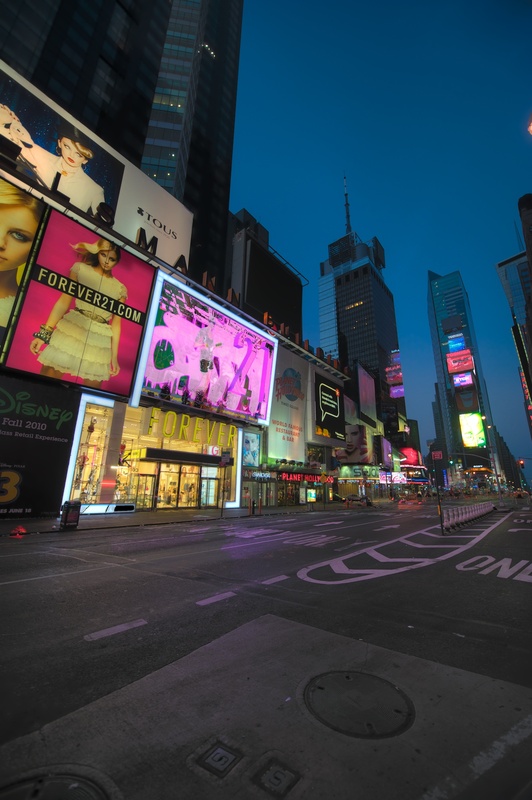 Another tough call, but I’m going witht his shot of an empty Times Square as my favorite for the month. Closing out this retrospective, September featured a lot of images from a photo walk in Tribeca, a newly processed image of a shot I took last October, and the milestone of 100 combined 100 Bus Stop and Crosswalk shots. I also managed to post daily even though a massive storm wiped out power in my neighborhood and knocked out power for a day. There are a lot of images I love. 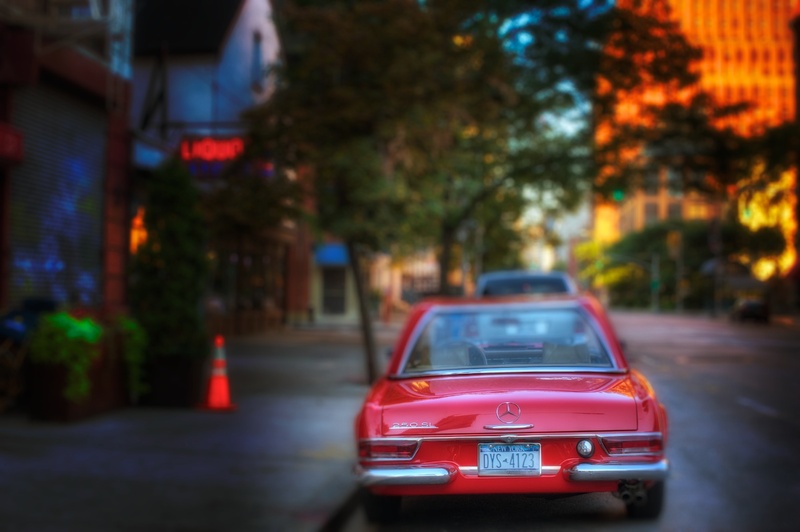 This shot of light reflecting on windows on West Broadway is probably the best, but the classic red Mercedes is my favorite. So that’s the year. There have been site design changes, and I have changed my blog workflow several times. I have made a lot more photo friends, nearly all through Twitter, since the initial set of folks who signed up to that post of Trey Ratcliff’s. I won’t try to mention any because I’m afraid of leaving someone out. Oddly, Trey himself seems mostly absent fromm Twitter lately, and not just because of his travels, but that’s fine. Figure out what works for you and do it. If you have any thoughts of starting a photo blog, give it a shot. Contact me and I’ll introduce you to a great group of Twitter photographers. After that it’s up to you. Hey man…congrats on the year and everything you’ve accomplished! I think I started really taking this stuff seriously about a year ago too, so it’s kind of neat to see where we’ve come in that amount of time! It’s been a great year, Mark – keep those images coming! Congratulations on your one-year! Fantastic to see your favorite shots and your work evolve and your blog grow. Of course, I have to pick my favorite from your list of favorites, and funny enough, it’s the first one you posted, from October 2009. Congrats on the one year anniversary! Keep it up…can’t wait to see what goodies you’ll have for us in the coming years! Happy blogday my friend!!! you are one of my inspiration photographer… :)… keep posting and making the way you are…!!! 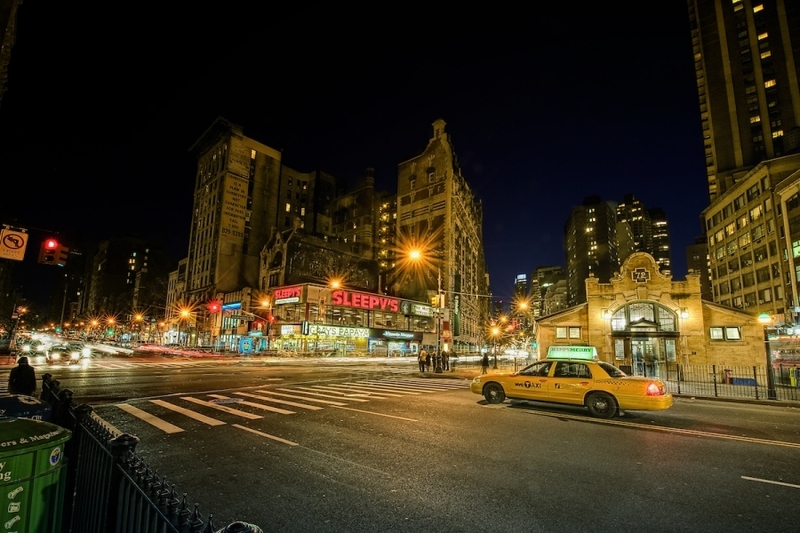 Keep on posting the wonderful photos of those exotic urban places… I just love them! Wow, thanks everyone. I have to jump in and reply to Mike, because while I was writing this yesterday I became curious about how long some other people have been doing this. Mike happened to be one of them, and if I remember correctly (and navigated his site properly) Mike, your first post was October 20 last year. You’ve 2 days to put your retrospective together, but no pressure or anything :). Holy crap Mark…two days!! I didn’t even realize it. Congrats on the anniversary, Mark. Cheers to many more years of great shots! This is great Mark! While I don’t remember exactly when I started photo-blogging, it’s probably right around a year as well. Even though I’ve been shooting for many years, I made it a point to start sharing my work. You have some really great images here, and I remember seeing them all. Great progress and great success this past year! Congrats again! Congratulations! Great collection of work! Look forward to seeing more! Paul. Happy blogiversary! Lot’s of great stuff that I obviously missed by finding your blog only recently. I guess I should really take the time to go to your previous entries, lots of great stuff to see. Congratulations! Very inspiring. Keep up the great work. Incidently, I love several of these images, which I hadn’t seen on the blog when posted. Congraulations! Very inspiring! Keep up the great work. I really like several of the early images, whicch I missed when they were posed. Congrats on the anniversary Mark. I’m glad we connected through Twitter. You have some truly inspirational work. Thanks again to everyone. It’s been great seeing the reception to this post in comments, tweets, and my traffic stats.